We will do some background research on your property to begin the Free Market evaluation. I hope you viewed the How to sell your property for more money … quickly video. That gives you an idea of the work that goes into selling your house. 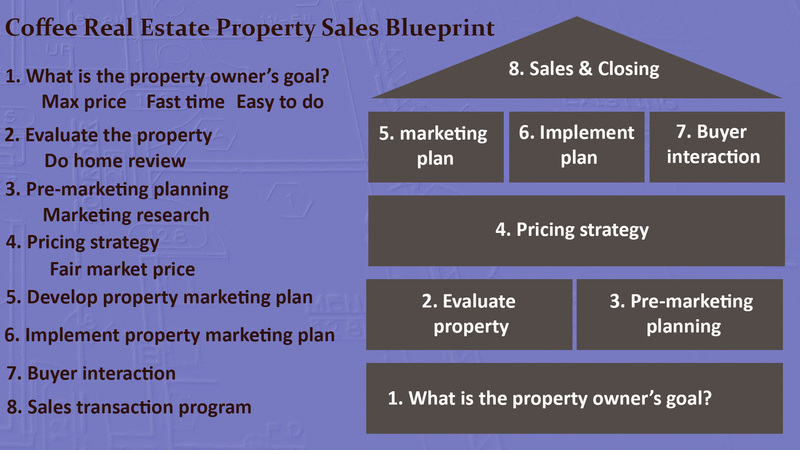 But the Property Sales blueprint is the path we take to achieve the goal of selling your property. Step one of the process is What is your goal? Do you the maximum price? Do you want it sold ASAP? Is ease of sale, close by a date, be able to lease back or any one of a thousand reasons to sell. The important thing is to communicate your reasons and goals to sell your property to us. Why is important? It impacts the pricing strategy and marketing plan. Getting it right from the start mean you will achieve your goals and not waste time doing what other people want. You can use the email or call us with your goals in selling your property. Here is a link for general information on the value of Coffee Real Estate selling your property.